Her müzisyen, besteci ve icracı için mükemmel bir partner olan Pa500, Pa800 ve Pa2X Pro'da kullanılan RX (Real eXperience) teknolojisine sahip yüksek kalitede ses sunan bir ritmli klavyedir. XDS Dual sequencer, dokunmatik ekran, anında quarter tone ve dört yönlü joystick ile zenginleştilmesine karşın fiyat olarak ekonomiktir. Korg'un EDS teknolojisine (Enhanced Definition Synthesis) sahip olmasının yanı sıra 80 ses polifoni ile ses kalitesi çok yüksektir. 880'in üzerinde hazır ancak editlenebilir (GM soundset ve 56 drum kit dahil), her müzik türüne hitap eden geniş yelpazede sese sahiptir. User bölümünde 128 ses ve 64 drum kit vardır. Dört stereo prosesör yanında yarı parametrik, zengin reverb ve muhteşem delaylerden, Korg'un REMS serisinden alınmış guitar türü modeling efektlerine toplamda 124 farklı efekt bulundurur. Mükemmel ses için her tracka bağımsız 3 bant EQ sunulmuştur. Dünyanın ileri gelen müzisyenleri tarafından hazırlanmış 320 hazır ritm içerir. Bu ritmler geniş yelpazede müzik türüne hitap etmekle birlikte icracının zamanlamalarını, akor değişikliklerini takip edebilmektedir. Sekiz partisi, dört varyasyonu, üç intro/count in'i, üç fill/break'i ve üç ending'i ile her ritm kendi içinde bir dünya gibidir. Tahsis edilebilir padler ile ek partiler yada riffler gerçek zamanlı olarak tetiklenebilir ve kullanılabilir. Syncro Start/Stop, Fade In/Out, Assignable Pad, Tap Tempo ve Manual Bass performanslara karmaşık ve profesyonel dokunuşlar katılmasını sağlayan öğelerdir. Özel Guitar modu sayesinde bir akor, capo pozisyonu seçerek ritme gerçekçi gitar partileri eklenmesi mümkündür. STS (Single Touch Settings) düğmeleri ile dört sese kadar klavye düzeni (split yada full klavye) kaydedilip tek düğme ile değiştirilebilir. 256 performans ayarının her biri bir şarkıyı icra etmek üzere ritmi, sesleri, efektleri, tempoyu, tonu ve scale'i otomatik olarak çağırır. Şarkı yazmak son derece kolaydır. Korg'un Dual XDS sequenceri iki şarkıyı anda çalma imkanına sahipken bu iki şarkı arasında DJ tarzı bir crossfader bulunur. SMF, Karaoke, GM dosyalarını çalabilmesinin yanında popüler karaoke formatlarının sözlerini de gösterebilme özelliğine sahiptir. SongBook özelliği sayesinde tamamen programlanabilir, bir şarkıyı çalmak için her türlü ayarı kaydedebilen bir müzik veri tabanı sunar. Dokunmatik ekranlı arayüzünün kullanımı kolaydır. Easy ve Expert olmak üzere iki modu vardır. Easy modda sadece temel ayarlar olduğundan anlaşılması ve kullanılması daha kolaydır. Uzman kullanıcılar için Expert modu mevcuttur. Bilgisayardan data alışverişi USB/MIDI bağlantısı kullanmasının yanı sıra SD/MMC hafıza kartlarına yazabilir ve bu kartlardan okuyabilir. Bass Reflex özelliğine sahip dahili hoparlörleri ile bu boyuttan alınabilecek en mükemmel sese sahiptir. Klavye: Velocity özellikli 61 tuş. ÖNEMLİ NOT: Bu ürünün içinde Türk ses ve ritmleri bulunmamaktadır ve daha sonra da yüklenememektedir. The Baby Blue, the Professional Arranger at an entry level price. For the musician, composer, performer and entertainer, the interactive Korg PA500 is the perfect musical partner. Like its big brothers the PA800 and the PA2XPro the PA500 uses our RX (Real eXperience) technology to deliver a sound unprecedented in an arranger keyboard. With exclusive Korg features such as the XDS Dual Sequencer, intuitive TouchView interface, quarter-tone on-the-fly and a four way joystick for realistic articulation, the only thing really missing is a big price tag. It all begins with sound. Based on the EDS (Extended Definition Synthesis) engine found in the Korg M3, PA800 and PA2XPro, the Korg PA500 provides 80 voices of polyphony and a breathtaking quality of sound. Over 880 fully editable sounds are preloaded (including a full GM soundset and 56 drumkits), representing a full range of musical instruments from almost every genre - each exploding with depth, nuance, subtlety, accuracy and richness. The User area has space for up to 128 user sounds and 64 drum kits. For many years, Korg workstations, synthesizers and digital recording studios have included outstanding studio quality effects that are simply breathtaking. In that same tradition, the PA500 offers four stereo processors plus a Final semi-parametric three band EQ containing a treasure trove of effects, from rich reverbs and dazzling delays to guitar-type modeling effects from Korg's renowned REMS series 124 different effects in all. And you'll appreciate the separate three-band EQ on each track so you can shape the tone for that perfect sound. No doubt: Korg's Style programming is world class. The Korg PA500 delivers a deluxe set of styles, programmed by some of the leading arrangers in the world; each of whom worked according to their musical strengths. The result is over 320 preloaded Styles that provide unparalleled realism and detail, adding anything from tasteful guitar picking, a tight bass and drum groove, a powerhouse R & B rhythm section all the way up to a full orchestra! Styles follow your timing, voice leading and chord changes to create an amazingly defined musical performance in real-time. With up to eight parts, four variations, three intros/count-in, three fills/break and three endings, each Style is a complete musical environment. Additional parts or riffs can be sequenced and triggered in real time using the assignable pads. Advanced features such as Syncro Start/Stop, Fade In/Out, Assignable PAds, Tap Tempo and Manual Bass allow you to spontaneously add complex and professional touches to your performances. Creating convincing guitar parts from a keyboard has never been easy until now! When creating a guitar part for your Style, you can chose a chord, capo position, and literally transform the keyboard into the fretted strings of the chord to allow realistic picking patterns, strums, chokes, slides, hammer-ons and other guitar-specific artifacts. The result is stunning. Best of all, the Korg PA500 can automatically enhance the guitar tracks of existing Standard Midi Files. With Korg's XDS Dual Sequencer, one can load as the other plays, and a DJ-style cross fader can blend between them, providing a seamless, continuous musical performance. The Korg PA500 can playback SMF (Standard Midi File), Karaoke files, and GM (General MIDI) files - and is able to display lyrics in most popular karaoke formats. There is also a practical Marker function to allow you to jump directly to a given position in the song: you can fix the markers using the internal sequencer (or using a computer based one - the marker format is standard) and then remix your favorite songs during a live performance for added spontaneity. The exciting SongBook feature was developed to make your life easier while playing live. The SongBook is a Musical Database, completely user programmable, containing all the settings needed to play a particular song. You have only to search for the song you would like to play by Song Title, Genre, Artist, Tempo, etc. and press play. Each SongBook entry will instantly recall every setting you've saved in order to play that song perfectly Sounds, Style, Performance, Volumes, Muted Tracks, FX settings, Easy Edit, STS settings, Master Transpose and more. This indispensable musical feature is unique to Korg. With all the technological power packed inside, it was vital that Korg also made the Korg PA500 easy to understand and easy to use. But Korg went even further, creating an instrument that provides an intuitive, musical, fast, foolproof experience. With our amazing TouchView display you can simply think, see and touch the panel for easy and intuitive control. So that musicians of all levels can make great music quickly, there are two interface modes: Easy and Expert. The Easy mode shows only the essential elements with bright, bold icons - useful for beginners or playing live while Expert mode provides full editing control. And when you need more information, check out the on-board contextual Help System in any of seven languages! In addition to 61-velocity sensing keys, the PA500 provides a four-way joystick, assignable switch, assignable slider, assignable pedal jack and four pads provide the tools to spice up your performance by changing effect settings, adding or muting parts, slowing the tempo, or even adding mini-sequenced solo, arpeggio, or backing riffs. Nothing stands between you and your professional performance. 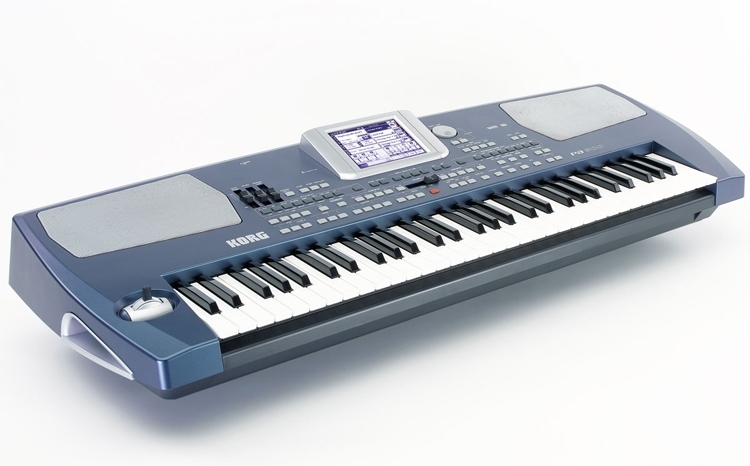 In addition to providing a USB/MIDI computer connection for moving and saving data, the Korg PA500 can also save and read data from SD / MMC memory cards for instant access to your custom data, MIDI files and songs. The back panel also features MIDI (In, Out), Audio Ins (1, 2) and Outs (L, R), headphone jack, plus a damper pedal and an assignable pedal connection. Hiding inside is a full stereo sound system with two double cone speakers in a bass reflex enclosure for the best sound in a small box. The Korg PA500 is completely self-contained and easily transportable whether rushing to perform live in front of any size audience, jamming with friends, or teaching a new tune to the other players. Korg couldn't fit any more fun in here if Korg tried. The Korg Pa500 is the younger sibling to the Pa800 and the Pa2XPro. Its technology is based on the same EDS (Extended Definition Synthesis) engine as its predecessors, providing 80 voices of polyphony, 880 editable sounds, a full pallet of effects and more than 320 preloaded Styles. Korg's Style programmes are produced by leading arrangers from around the world. Each Style follows the player's timing, voice leading and chord changes to create musical performances in real time. Styles on the Pa500 feature up to eight parts, four variations, three intros/count-ins, three fills/breaks and three endings. Korg is also keen to highlight the keyboard's guitar mode. This enables you to create guitar parts for your Style by choosing a chord and capo position, then adding realistic picking patterns, strums, chokes, slides, hammer-ons and other guitar techniques. 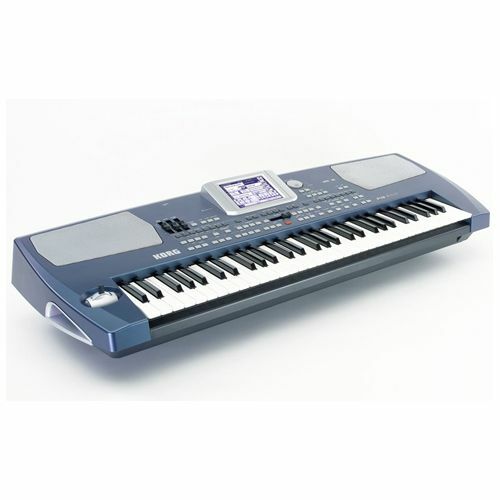 The Korg Pa500 Arranger Keyboard is a 61-key arranger that features Korgs EDS (Extended Definition Synthesis) technology for remarkably realistic sound reproduction. The Pa500 also features 80-note polyphony, 61 velocity-sensitive keys, and USB and MIDI connectivity for easy interfacing with computers and other instruments. The product can be connected to an amplifier or played through a PA system, while the onboard stereo speakers, which have bass reflex enclosures, are handy for playing and composing on the fly. Korgs main objective for the Pa500 is ease of use, and the company has done a remarkable job. Out of the box, the Pa500 can be up and running and creating music with little or no help from the manual (though the onboard Help section is a nice touch). Navigating different functions of the arranger is easy with the touchscreen display and a four-way joystick. Two different modes, Easy and Expert, allow users to customize the way they interact with the keyboard. Easy mode, which is the standard, loads up as the default setting when the keyboard is turned on. Its easy to navigate and the display is large and clear enough for use during live performance. Expert mode packs a little more into the screen, but allows the user to have full access to all of the arrangers more powerful controls. One of the most impressive features of the Pa500 is Guitar Mode, which essentially transforms your keyboard into the fretboard of a guitar. You can choose a chord and capo position and then play chords, picking patterns, hammer-ons, pull-offs and slides all through effects and amp models that produce a realistic guitar sound. The amp models and effects are just some of the 128 total effects. Reverbs, delays, compressors, EQs and 56 different GM drum kits are some of the effects loaded onto the Pa500. One unique feature Korg has built is functionality for loading up to four different sounds, which can then be split up and layered across the keyboard. For example, you could play piano, bass, organ, and acoustic guitar. Then, with the push of a single button, change the acoustic guitar sound to electric for a solo. The Pa500 also includes a Song and Style mode. Style mode includes 320 preset styles with instrumentation and arrangements to back you up while you play. Often including bass/drum/percussion grooves but also stretching all the way up to full orchestral arrangements this mode follows your timing, chord changes, and voice leading in real time. Song mode allows for easy recall of song settings (effects, tempo, song title, genre) so that users can play along with popular songs. Lyrics can also be displayed in popular karaoke formats. The Pa500s XDS Dual Sequencer allows you to load up new songs while the other is playing, and a cross-fader can be used to seamlessly transition to the next song. Value and performance meet in the Korg Pa500. From stage to studio, or simply your living room, theres not a whole lot that you cant translate from your head to this keyboard.